Aluminum clusters move along graphene tracks, controlled by applied electric currents, in work by Spanish and Dutch researchers. 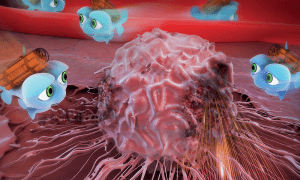 A long-dreamt-of goal of nanoscience is to deliver materials in a controllable fashion on the nanoscale. Atoms have already been manipulated individually using a scanning tunnelling microscope tip, but this is not feasible on a large scale. 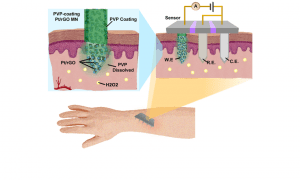 Carbon nanotubes are also being used to convey atoms by use of an electric current along the tubes; these are chemically and mechanically stable so can withstand the large current needed to achieve this movement. Graphene shares many of the properties of carbon nanotubes but in addition is flat so can be used in conventional lithographic surface-modification techniques, so potentially on a large scale. 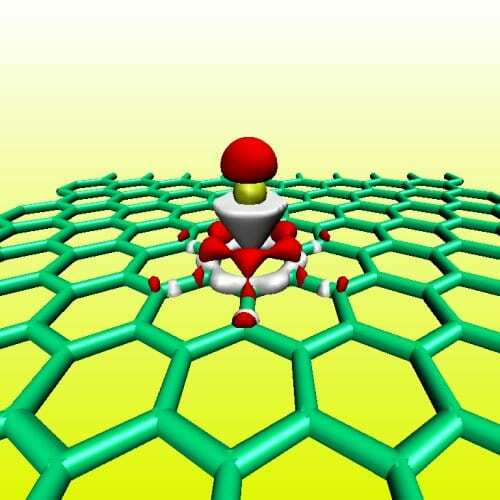 However, until now transport on graphene has not been achieved. 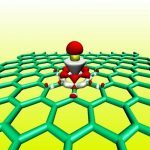 Now, in an important breakthrough, a team led by Adrian Bachtold at ICN-CSIC at Barcelona, Spain and with members at the Kavli Institute, Delft, The Netherlands, and ICMAB-CSIC and ICMM-CSIC in Bellaterra and Madrid, Spain, has achieved controlled movement of metal atoms and clusters on graphene for the first time, by using an electric current. They produced a set of electrodes patterned in a crossroads fashion and were able to make tiny aluminum clusters move first forwards and then at a right angle to their original motion, by applying current from first one and then a perpendicular direction. Interestingly, gold does not behave in the same way and diffuses randomly on the surface despite the strong electric current. The researchers put this down to the different charges on the metals caused by charge transfer from the graphene surface. Bachtold and his team have also done theoretical calculations which show that, in their system, aluminum’s movement is controlled by the electricity (called electromigration) whereas gold’s movement depends on the surface temperature. Unlike in previous work, in which it was believed that the so-called wind force (resulting from the scattering of electrons or holes by impurities in the surface) dominated, the scientists believe that in their system the wind force for aluminum is negligible and electrostatic forces are more important. The team hope that their discovery will be of use in making complex circuits in the future. They also believe that further work on their system might be able to confirm theories put forward by famous past theoreticians such as Friedel, Peierls, and Landauer, but never proven. They call for more high-resolution work to be done at the single-atom scale.